Virtually every band breaks up at one point or another. What happens after that can vary quite a bit. Sometimes the former members launch solo careers, and sometimes one or another of them will try to reorganize a revised group, which may or may not be good thing musically. While some band members can be relatively easy to replace, it's not so easy when one has a group whose principal sound is based on tight two-part vocal harmonies. This happened with two famous duos, Simon & Garfunkel and the Everly Brothers and the two represent different extremes: Paul Simon flourished on his own, while Don and Phil Everly never had much of a solo career without each other. This week's album is one by one half of a fine vocal duo torn asunder by typical personality and artistic forces. 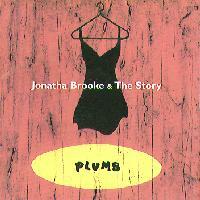 It's listed as being by Jonatha Brooke and the Story, and it's entitled Plumb. Jonatha Brooke and Jennifer Kimball started singing together in 1981 as freshman at Amherst College, when they both auditioned for a chorus. They found that their vocals blended particularly well. Their sound was marked by very distinctive two-part harmonies, often with unusual and briefly dissonant musical intervals more like jazz than folk. Though they occasionally performed before audiences, they didn't really intend to make a career of their music. After college Ms. Brooke joined a dance company and Ms. Kimball became a visual artist for a publishing company. In 1989 Ms. Brooke's husband convinced the two to record their songs. The tape, Over Oceans, was heard by Green Linnet Records who signed the duo. The Celtic-oriented label was starting a division to feature American folkies. Ms. Brooke told me in an interview shortly after their debut album that their record contract was virtually unsolicited. Then Elektra Records picked up The Story's 1991 debut recording on Green Linnet and re-released it on Elektra with all the distribution of the Time-Warner label. In 1993, The Story, now on Elektra, released The Angel in the House, which featured much the same personnel as their debut, but with a rather more produced sound. Listed as executive producer was Tommy LiPuma, best known for his light jazz-pop productions with George Benson and Michael Franks. The more mainstream pop direction was clearly in evidence on The Angel in the House, but the album still had some of the duo's best work. Last year, Brooke and Kimball parted company amicably after twelve years together, and most fans thought the Story was over. Ms. Kimball had decided to take a break from music. Ms. Brooke the songwriter aimed to carry on, but Elektra was not interested. Meanwhile, LiPuma was involved in the revival of the old Blue Thumb label which was active in the early 1970s with artists like Dave Mason. He offered Ms. Brooke a place on the record company. The result is the new CD, by Jonatha Brooke and the Story -- with more or less the same backing band as before, minus Ms. Kimball's vocal harmonies. The sound is yet another small step toward mainstream pop, and away from the eclectic mostly acoustic sound of their debut recording. The result is an enjoyable contemporary singer-songwriter album that spotlights more of Ms. Brooke's thoughtful, literate songs, but one which will leave fans of the original Story seriously missing the creative vocal harmonies that were so much a part of Brooke and Kimball's sound. Ms. Brooke had written much of the group's music specifically with Ms. Kimball's vocal harmonies in mind, so inevitably this album represents a significant change in sound. While it is understandable for the sake of recognition and continuity that Ms. Brooke continues using the name The Story, the group's fans would probably be more receptive to this recording if there were not the expectation that the vocal duo's sound would be preserved. Ms. Brooke does a little overdubbing of harmonies, and there is a guest appearance my Bruce Cockburn singing a duo on one track, but for the most part, Ms. Brooke's solo vocals carry the day, along with instrumentation featuring an acoustic guitar joined by instruments and some arrangements that borrow from 1990s pop. The backing band includes members going back to the first Story release, Duke Levine on guitar, Michael Rivard on bass, and Allain Mallet on keyboards. Mallet who co-produced the previous two Story albums is the sole producer here. The one change is in the drummer. Abe Laboriel (Jr.), son of the well-known as a jazz and fusion bassist, plays the drums throughout most of Plumb. The title of the album, by the way, is a dual reference to "plumb" in the sense of a carpenter's tool for determining a true straight line, and also in the sense of to plumb the depths of emotion. Ms. Brooke has said that some of the soul-searching had to do with the breakup of the musical partnership. But lyrically, most of the songs explore personal relationships from a variety of different viewpoints, including love at first sight to parting bitterly. There's also a political protest song on which Cockburn makes his appearance. The album begins with Nothing Sacred, one of those songs about the angry end of an affair. Though Ms. Brooke does vocal harmony parts through overdubbing, she makes no attempt to sound like the approach of the old Story. The electric instrumentation is also characteristic of this album. Another song of no love lost is Where Were You. The rocking accompaniment occasionally resembles Memphis R&B. It allows Ms. Brooke to show another facet of her vocal style we didn't get to hear much in her duos with Ms. Kimball. The first three tracks all explore the end of a relationship. A very different viewpoint is taken on the third piece, Inconsolable, whose principal character is that way after the parting. It's also one of the more mellow arrangements, done as a slightly jazzy waltz. The track with Bruce Cockburn is called War. Lyrically it's a good old-fashioned 60-style anti-war protest song, though you could never tell it from the gentle, melodic musical accompaniment. A somewhat more conventional love song is Made of Gold, typical of Ms. Brooke's subtle and literate lyric writing. This track is a good example of her transition from half of a duet to a singer-songwriter on her own. Stylistically, a track that comes as a bit of a surprise is Is this All. The piece has a drum machine rhythm and vocal harmonies more in common with easy-listening pop than folk, but it's a nice song with a fair amount of depth. In a recent interview, Ms. Brooke said her favorite track on Plumb is a song called Paris. It's another fine composition in waltz time, accompanied by a string quartet and Brooke's acoustic guitar. It also features her wonderfully unadorned voice. The album ends with its biggest production number, Charming, one of the rockiest tracks with all kinds of things from a 60s-syle psychedelic guitar to Irish bagpipes thrown into the mix. It's reminiscent of Jane Siberry's early albums. Plumb, the new album by Jonatha Brooke and the Story, represents a significant change from the sound of the vocal duo she had with Jennifer Kimball, which is what the Story used to be. Ms. Brooke has had to find a new approach after her twelve years of collaborating with and writing songs around the pair's distinctive duet harmonies. From this album, I think she is still searching for a musical identity, but there is no shortage of good new material on Plumb, especially lyrically. The backing band is more or less the same as before, but the arrangements and production are decidedly the most commercial-sounding effort from Ms. Brooke yet. That production is sometimes a bit heavy for my own taste, though at others, the arrangements' eclecticism can add a lot depth. Sonically, the album is well mixed, but suffers from excessive compression, robbing the music of a lot of its subtlety and dynamics. That seems another part of the strategy to give Ms. Brooke's music more commercial potential. Many of the long-time fans of The Story might not take to Plumb at first, with the lack of Ms. Kimball's vocal harmonies and the more mainstream-pop influenced sound of this CD. But appreciated as a literate singer-songwriter record with a mostly electric backing, it makes for worthwhile listening that will reveal new facets at each hearing. (c) Copyright 1995 George D. Graham (revised 8/6/96) All rights reseved.